^ 1.0 1.1 Savory, R. M. and Roger Savory, Introduction to Islamic civilisation, (Cambridge University Press, 1976 ), 82. ^ Aḥmad of Niǧde's "al-Walad al-Shafīq" and the Seljuk Past, A. C. S. Peacock, Anatolian Studies, Vol. 54, (2004), 97; With the growth of Seljuk power in Rum, a more highly developed Muslim cultural life, based on the Persianate culture of the Great Seljuk court, was able to take root in Anatolia. ^ Meisami, Julie Scott, Persian Historiography to the End of the Twelfth Century, (Edinburgh University Press, 1999), 143; Nizam al-Mulk also attempted to organise the Saljuq administration according to the Persianate Ghaznavid model..
^ 10.0 10.1 10.2 M.A. Amir-Moezzi, "Shahrbanu", Encyclopaedia Iranica, Online Edition, (LINK 互联网档案馆的存檔，存档日期2007-03-11. ): "... here one might bear in mind that non-Persian dynasties such as the Ghaznavids, Saljuqs and Ilkhanids were rapidly to adopt the Persian language and have their origins traced back to the ancient kings of Persia rather than to Turkmen heroes or Muslim saints ..."
^ 13.0 13.1 Jonathan Dewald, "Europe 1450 to 1789: Encyclopedia of the Early Modern World", Charles Scribner's Sons, 2004, p. 24: "Turcoman armies coming from the East had driven the Byzantines out of much of Asia Minor and established the Persianized sultanate of the Seljuks." ^ Possessors and possessed: museums, archaeology, and the visualization of history in the late Ottoman Empire; By Wendy M. K. Shaw; Published by University of California Press, 2003, ISBN 0520233352, 9780520233355; p. 5. Jackson, P. Review: The History of the Seljuq Turkmens: The History of the Seljuq Turkmens. Journal of Islamic Studies (Oxford Centre for Islamic Studies). 2002, 13 (1): 75–76. doi:10.1093/jis/13.1.75. ^ C.E. Bosworth, "Turkmen Expansion towards the west" in UNESCO HISTORY OF HUMANITY, Volume IV, titled "From the Seventh to the Sixteenth Century", UNESCO Publishing / Routledge, p. 391. ^ Mehmed Fuad Koprulu's, "Early Mystics in Turkish Literature", Translated by Gary Leiser and Robert Dankoff , Routledge, 2006, pg 149. ^ Stephen P. Blake, "Shahjahanabad: The Sovereign City in Mughal India, 1639-1739". Cambridge University Press, 1991. pg 123: "For the Seljuks and Il-Khanids in Iran it was the rulers rather than the conquered who were "Persianized and Islamicized"
^ Encyclopaedia Britannica, "Seljuq", Online Edition, (LINK): "... Because the Turkish Seljuqs had no Islamic tradition or strong literary heritage of their own, they adopted the cultural language of their Persian instructors in Islam. Literary Persian thus spread to the whole of Iran, and the Arabic language disappeared in that country except in works of religious scholarship ..."
^ F. Daftary, "Sectarian and National Movements in Iran, Khorasan, and Trasoxania during Umayyad and Early Abbasid Times", in History of Civilizations of Central Asia, Vol 4, pt. 1; edited by M.S. Asimov and C.E. Bosworth; UNESCO Publishing, Institute of Ismaili Studies: "... Not only did the inhabitants of Khurasan not succumb to the language of the nomadic invaders, but they imposed their own tongue on them. The region could even assimilate the Turkic Ghaznavids and Seljuks (eleventh and twelfth centuries), the Timurids (fourteenth–fifteenth centuries), and the Qajars (nineteenth–twentieth centuries) ..."
^ "The Turko-Persian tradition features Persian culture patronized by Turkic rulers"." See Daniel Pipes: "The Event of Our Era: Former Soviet Muslim Republics Change the Middle East" in Michael Mandelbaum, "Central Asia and the World: Kazakhstan, Uzbekistan, Tajikistan, Kyrgyzstan, Turkemenistan and the World", Council on Foreign Relations, p. 79. Exact statement: "In Short, the Turko-Persian tradition featured Persian culture patronized by Turcophone rulers." ^ Grousset, Rene, The Empire of the Steppes, (Rutgers University Press, 1991), 574. ^ Bingham, Woodbridge, Hilary Conroy and Frank William Iklé, History of Asia, Vol.1, (Allyn and Bacon, 1964), 98. Golden, P. B., Harrasowitz, O. (1992) An Introduction to the History of the Turkic Peoples. pg 386. 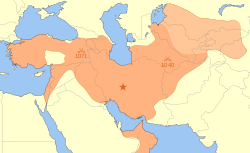 According to Fridrik Thordarson, "Iranian influence on Caucasian languages. There is general agreement that Iranian languages predominated in Azerbaijan from the 1st millennium b.c. until the advent of the Turks in a.d. the 11th century (see Menges, pp. 41-42; Camb. Hist. Iran IV, pp. 226-28, and VI, pp. 950-52). The process of Turkicization was essentially complete by the beginning of the 16th century, and today Iranian languages are spoken in only a few scattered settlements in the area."